If you’re paying through the nose for hot water in your house, you’ve probably already thought about replacing your conventional water heater with a new tankless, or on-demand, water heater. But tankless water heaters run on natural gas or propane. What if you don’t have gas service to your house? Tankless water heaters can save you 40% or more on your hot water bill simply because, rather than keeping forty gallons or more of it perpetually hot in a storage tank, they only heat the water you’re using, as you’re using it. If you live in an area without gas service, however, electric used to be your only option. Standard tank-style electric water heaters are cheap—until the element goes or they spring a leak. And somehow they know when it’s the coldest day of the year. 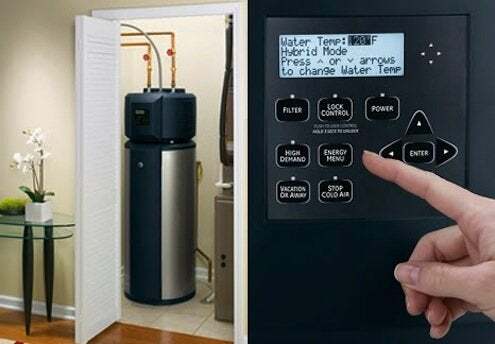 Now, however, there are hybrid electric water heaters that use super-efficient heat pump technology, paired with a standard electric element for backup, to cut electric water heating costs in half. Tankless Water Heaters: Should I or Shouldn’t I?